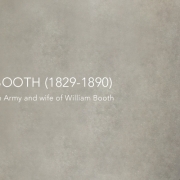 Catherine Booth (1829-1890), the co-founder of The Salvation Army, talks about achieving true peace, how our hearts can be made perfect, and what a Christian can learn from one of Napoleon’s soldiers. None of our hearts are born perfect by nature, but they can be renewed to be made perfect. For this, first, a heart must be loyal to God. It should be thoroughly given to Him, irrespective of consequences. Second, a heart must be obedient. A perfect heart does not pick and choose which commandments to obey. Hearts that do so are partial, not perfect. Third, at the root of all perfect hearts, is trust. Look no further than Abraham to see a heart perfect in its trust. Abraham believed God almost to the blood of his son Isaac, and God showed Himself strong in his behalf. Our charity must be divine and focused on the soul. Sentiments of pity and acts of generosity towards man is sometimes done all without a spark of divinity in one’s heart. Or worse, it may be simply done to merit one’s own eternal life. Those are examples of nothing but false charity; they begin in self and end on earth. Are we more concerned about relieving temporal distress, in others and in us, than we are about feeding famished souls? Divine charity, such as when Christ fed both the spirit and the hunger of His followers, realizes the value of looking after the soul. Peace is the universal want of man, but true peace is not simply a state of mere quietness or insensibility. True peace only arises out of a reconciliation with God. Where there is sin, there is conflict and misery. God Himself cannot give peace to a soul holding on to sin. But when one confesses and forsakes their sins and casts their guilty soul on Jesus, then He will give that soul true, divine peace. It will abide forever. It is said that one of Napoleon’s men, while being operated on for the extraction of a bullet, exclaimed, “Cut a little deeper, and you will find my general’s name.” Napoleon’s name was engraved on that soldier’s heart. As God’s soldiers, the image and glory of Christ must be engraved on our hearts as well. It is what Jesus Christ demands of us. We must be thoroughly committed to His side; there can be no neutrals in spiritual warfare. Here is great encouragement for those of us who suffer from doubt. Faith, as it is described in the Scriptures, is a voluntary thing. I have known sincere and honest souls whose minds are tormented with doubt, but whose hearts have still inquired about God’s love and truth. I have more sympathy towards them than with those who would profess all and do nothing. God believes in man’s honesty and sincerity. If you are sincere in your heart, He will not abandon you. 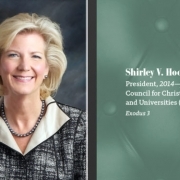 With a sense that they have been called, and with an appreciation for the groundbreaking role they are assuming, women have been taking over the leadership of Christian colleges and universities in slowly increasing numbers. Religious schools still lag far behind secular institutions in the appointing of female presidents, but the ceiling has been broken in schools across the country that were established in the holiness tradition. While being the first woman president is an hono..